Would you like to show a unordered or ordered list in your Envira caption? This is simple with the use of a custom function inside a plugin. This tutorial will walk you through the steps of what you need to add lists to your Envira caption. This tutorial is a bit more technical than our other docs. In order to use list items in your Envira caption, please review the steps below. To use HTML for ordered and unordered lists in your Envira caption, just add the following code to a new file at wp-content/plugins/envira-text-format-for-captions.php. Your next step is to activate the plugin you just uploaded. 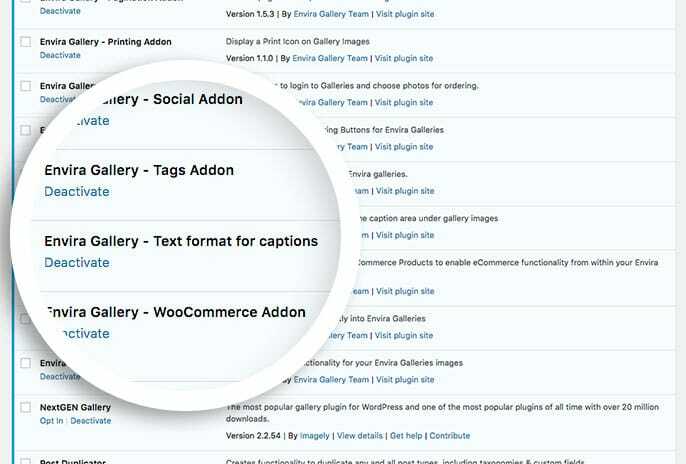 Simply navigate to the Plugins from within your WordPress dashboard and activate the Envira Gallery – Text format for captions plugin. And that’s it, you’re all done! Would you like to try adding some CSS for you Envira lightbox? Check out our tutorial on How to Remove the Lightbox Border.